Hey blog readers, my name is Gabriela Munoz and this is my first season working as a right whale observer for the New England Aquarium. I've recently graduated from Bates College where I wrote my thesis on the effects of vessel traffic on bottlenose dolphins so the work I'm doing down here with right whale ship mitigation ties in nicely with my previous research. Our current calf count is at 18. There have been a few interesting mothers this year. Most reproductively active mothers have calves on average every three years, i.e. a three-year calving interval. 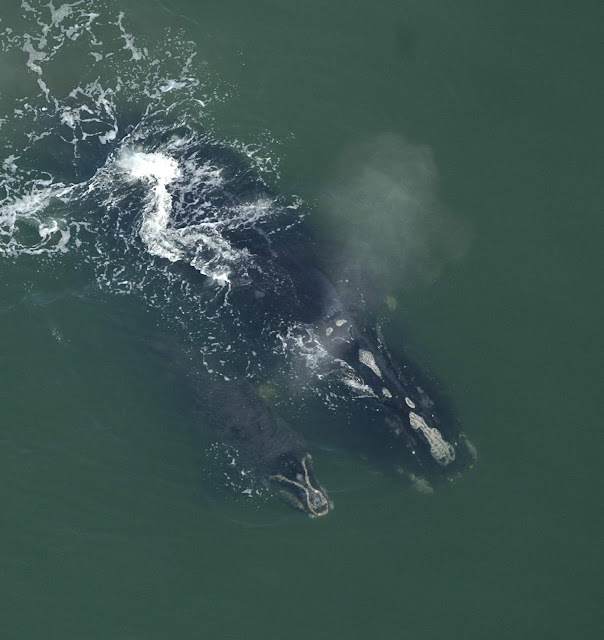 However, three of our mothers, Eg# 1802, 1243, 1301, have had two-year calving intervals after losing their 2006 calves. We have also had a handful of young first time mothers. Females are believed to reproductively mature at about 9 years of age but Eg# 3292 had her first calf this year at the age of six! Eg# 3130 and 3180 both had their first calves this year as well and they are 7 years old. Eg# 1243 has given birth to her fifth calf this year and has the largest number of offspring compared to the other mothers of this season. Last year at this time, the calf count was at 18 but four more calves were bornafter the season ended bringing the calf count up to 22. This season we have seen two young females together, Eg # 3142 and 3240, consistently. This has been observed with other pairs of pregnant females this year who have been seen traveling down together or have paired upon their arrival to the Southeast calving grounds and then separate once they have given birth. There is no quantitative data at the moment to support this type of association with pregnant females but it might be worth looking at previous and future years to see if there are trends. I'm still holding out hope that this pair or other females might calve. We've had a bad stretch of weather this past week with high winds so we have been unable to locate any stragglers or any potential calving mothers. Despite the calving season winding down, I still have hopes that one or two more calves will be born. Every calf counts with this small critically endangered specie so fingers crossed for a couple more calves!